Cheer on your favourite snail in the race of the century! 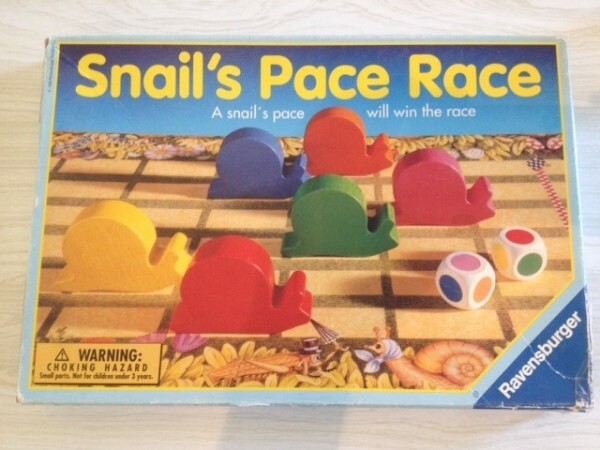 Snail’s Pace Race is designed to be a non-competitive game. Instead of racing against each other, players take turn rolling the custom dice to see which snail is the fastest. This makes Snail’s Pace Race more like a simulation than a true game, but it can still be fun to play. 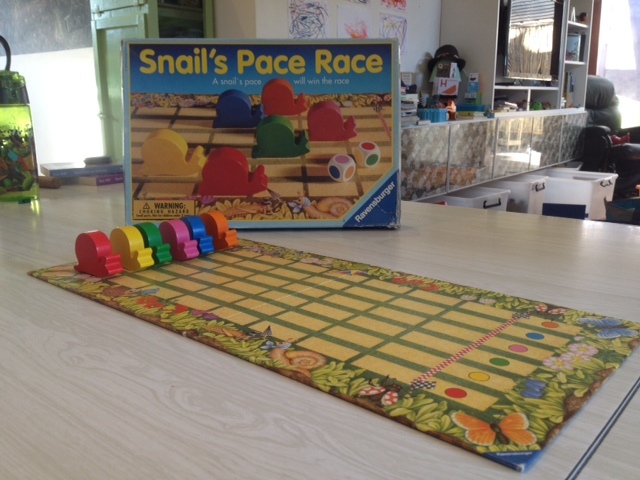 At the beginning of the game each snail is placed at the starting line in the lane matching their colour. Regardless of how many players there are, all six snails take part in each race. Players then take turns to roll the two custom dice, which instead of numbers have a large round dot on each face matching the colours of the six snails. Depending on the colours rolled on the dice, snails are advanced either one or two places on the race track. For example, if you roll a blue dot on one dice and a red dot on the other, the blue and red snails move forward one place each. If you were to roll two dots of the same colour, e.g. two blue dots, then the lucky snail of the same colour moves ahead two places instead of one. And that, my friends, is the pretty much the entirety of the game. Players keep rolling the dice until one snail wins the race. Or two snails win, as the game mechanics make ties relatively common. The non-competitive nature of this game makes it appealing for younger children who are just learning to play games and may find the concepts of winning and losing a bit overwhelming. The gameplay is nice and simple and children latch on to the dice rolling and movement concepts very quickly. I think this game is best played in a larger group, such as a family or a group of children with a teacher, as you can liven up the game by lots of cheering and commentary as the snails hurtle to the finish line. Imagine you’re recreating the atmosphere at an exciting horse race, only without the whipping and drunken spectators (though there’s nothing to stop consenting adults from doing this once the children have gone to bed). I picked up a copy of the 1994 Ravensburger edition at our boys’ kinder fete, where the game apparently served with distinction for the better part of two decades. Although the box had some minor wear and tear, the cardboard racetrack and wooden snails were still in great condition. The snails in particular are very nicely made – they’re large enough and just the right weight for young children to handle easily. The snails’ resemblance to the famous meeples of Carcassone has been noted by other gamers, earning these supercharged escargots the nickname of ‘sneeples’. But the snail pieces are actually a fair bit larger than their French peasant counterparts, and if it came to a direct confrontation between the two my money would be on the snails. I can definitely see this as an old-school Avalon Hill hex and counter two-player wargame. Meeples vs Sneeples: The Battle for Provence, anyone? Like Build a Beetle (also reviewed here at Games vs Play), the main drawback with Snail’s Pace Race is that the game has only one game mechanic, and it’s entirely random. 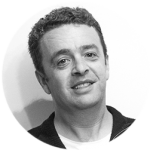 There’s no way for players to influence the outcome of the race other than rolling the dice – you really are much more like spectators at an event rather than participants. Children could get bored of this very easily, while others might find the non-competitive aspect a bit dull. Where’s the fun in playing a game if you can’t win? But I think a strength of this game is that it’s so simple that children can make up their own rules to change the gameplay. Yes, we’re talking about pre-school mods here. How terrifying! So, although kids may not get a lot of mileage out of Snail’s Pace Race before wanting something more challenging to play, I think it’s still a good starting point for young children just learning to have fun playing boardgames with their families or teachers. If winning isn't everything, this is the game for you. Also, must like snails.